My nieces gave me amazing handmade gifts for my birthday this year. I received this hand decorated pillowcase (see above and below). 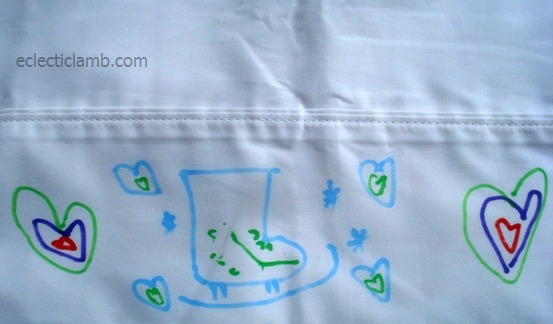 My 8 year old niece used fabric markers to decorate both sides of a pillowcase. I love it! I think that her little lambs are very cute. She also made a letter K for me. So special! 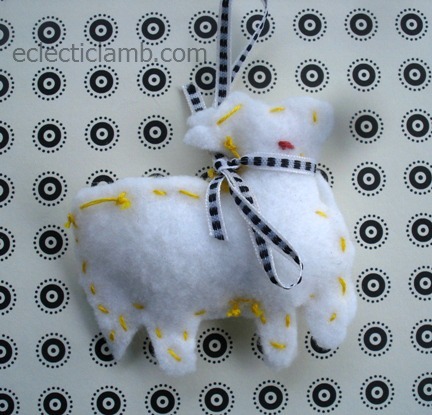 My 11 year old niece made a lamb ornament for me. She did it all herself. 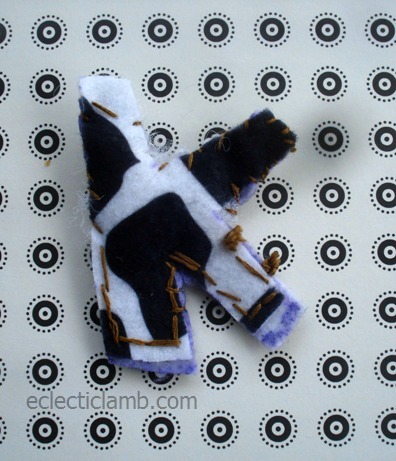 She made the pattern, cut the felt, embroidered the eye, stuffed, and sewed it. I love it! She also made a special bookmark. She drew and stitched two sheep. She sewed one and left one for me to stitch. So cute! This entry was posted in Crafts, Embroidery and tagged handmade gifts. Bookmark the permalink. Those are so awesome, well done girls! What a wonderful gift, Happy Birthday! I love these handmade gifts–so sweet and thoughtful! May I re-blog this post? Yes of course! Thank you so much! Great–I’ll probably do it tomorrow or Sunday! These gifts seem to me to be perfect examples of the charm and appeal of “loving hands at home”! The gifts are personal, thoughtful, and absolutely one-of-a-kind! Who wouldn’t cherish this sort of present? Yes they are. Thank you!